A B. procyonis larva is migrating through this cross-section of a rabbit brain. The intestine of an Indiana raccoon yielded this adult roundworm, Baylisascaris procyonis. This gray squirrel shows signs of the neurological disease caused by the larvae of the raccoon roundworm. All photos courtesy Kevin Kazacos, Purdue University. . When parasite expert Kevin Kazacos looked into a die-off at a chicken farm in Indiana in 1979, he found it "dramatic, so pathogenic, it looked like nothing I'd dealt with before." The birds showed signs of central-nervous system disorders -- problems with walking and standing, and the death rate was staggering -- 622 birds died in seven weeks. The next year, he saw similar symptoms in quail housed in a pen formerly used by pet raccoons. As similar cases came to his attention, Kazacos, a professor of veterinary parasitology at Purdue University, pinned the blame on larvae of Baylisascaris procyonis, a roundworm parasite of raccoons that had been identified in the 1940s. Kazacos has since found the parasite larvae in 75 species of animals, including dogs, foxes, kangaroos, 26 types of rodent, and 23 kinds of bird. These animals lived in zoos, labs, homes and the wild. In 1980, he saw the first confirmed human death, a Pennsylvania boy who apparently had eaten feces from raccoons living in the family's chimney. Like the birds, the boy had neurological problems and trouble controlling his muscles. The autopsy showed roundworm larvae in his brain. 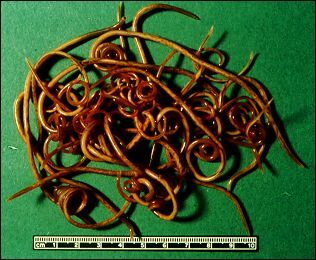 Baylisascaris procyonis is a zoonotic parasite, meaning that humans can catch it from animals. Well-known zoonotic diseases include rabies, transmitted by the bite of an infected mammal, hantavirus, carried by deer mice, and Lyme disease, carried by deer ticks. To the public, zoonotic diseases are a little-recognized hazard posed by animals around us. While deer threaten our vegetation and cats waste our birds, zoonotic diseases head directly for us. And because raccoons are more common in cities and suburbs than in rural areas, they (and their zoonotic diseases) represent some of the more dangerous urban wildlife. To date, 10 children, and one adult, have come down with fatal or severe neurological disease from B. procyonis. Children are stricken more commonly due to their habit of "geophagia" (the exquisite scientific term for eating dirt), and generally cramming stuff in their mouths. Most people don't develop symptoms. But if you eat enough microscopic eggs of B. procyonis, it can be hazardous to your health. "Children can lose the ability to sit up, to hold their heads up, to use their hands or feed themselves," Kazacos says. Generally, by the time the disease is recognized, the larvae have already started burrowing through the brain, so it's too late to prevent damage. But in animal colonies where B. procyonis was known to be present, quick drug treatment of new infections did limit the damage. The human disease is rare enough that it's seldom diagnosed until more common causes of neurological disorder have been ruled out, by which time, severe or fatal neurological damage may have occurred. The nature of the damage depends on where the larvae migrate. B. procyonis larvae have caused eye disease in dozens of people. Which brings us to the unpalatable topic of recognizing raccoon guano. Kazacos describes these excretions as being dark in color, tubular is shape, and between cat and dog in size. Like people, raccoons prefer to relieve themselves in certain areas. These so-called "latrines" are generally on horizontal surfaces, such as downed logs, tree crotches, flat stones or barn lofts. Since each defecation can contain millions of eggs, latrines are focal points for infection. Even after the raccoon manure has rotted away, the eggs may remain -- in moist soil, they stay alive for several years. Aside from recognizing and avoiding latrines (see "Raccoon Latrine Structure..." in the bibliography), other sensible precautions include washing hands after being outdoors, not keeping raccoons as pets, and disinfecting any latrines in accessible areas, such as barns. Eggs of B. procyonis and other ascarid worms are resistant to disinfectants, but steam or heat from a propane torch cooks them dead. Why did evolution make this roundworm so nasty to so many vertebrates, but not to raccoons? Because parasites seem to ensure their survival by changing the behavior of their hosts. The adult form of B. procyonis is a worm that lives in the raccoon's gut, costing the animal food but seldom killing it. The worms release millions of eggs in the raccoon's feces. When an animal ingests them, these larvae hatch. Those that move to the brain burrow in, causing direct damage and inflammation. The resulting central-nervous system disturbances may make the animal stupid and sluggish. If the larvae kills the animal, it becomes easy food for a generalist feeder like the raccoon. Either way, the host's changed behavior makes it easier for the roundworm to complete its life cycle by infecting another raccoon. And infected they are: Kazacos says the parasite usually occurs to some extent wherever raccoons are found. Between 70 percent and 82 percent of raccoons in the Midwest are infected, with the highest prevalence in the fall. Go wild over urban wildlife readings. There are 1 2 3 pages in this feature.